Just days after the grand opening of the city's first ever production brewery, comes news that yet another is set to begin construction in Arlington. Legal Draft Beer Co. will be located at 500 E. Division, right across the railroad tracks from Division Brewing's new spot on Main Street. 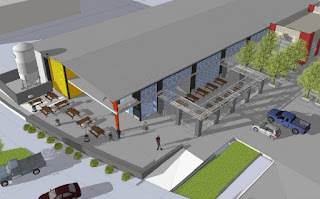 The city's second brewery, and third active brewing operation overall, will be built using 14,000 square feet of an existing 25,000 square foot building, with plans calling for renovations both inside and outside of the space. 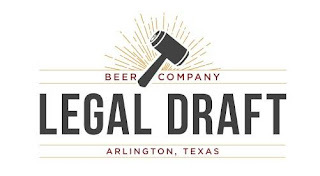 According to Legal Draft founder Greg McCarthy, the brewery's interior will house the production area and a 2000 square foot climate-controlled taproom, with a 4000 square foot exterior layout consisting of a covered patio, shaded arbor and landscaped beer garden. McCarthy's intent is for the environment to be family friendly, something he hopes to encourage by offering house-made sodas for kids and other non-drinking customers. managed by Dodson Development (image the property of Dodson Development). Regarding production, McCarthy has acquired a 17-barrel brewhouse designed by IDD Process & Packaging, Inc. of California. The high-efficiency system is capable of completing up to a half-dozen batches in 12 hours, which means Legal Draft will have the ability to brew over 100 barrels of beer per day. While the brewery won't be going at full capacity right away, McCarthy says the setup will allow him to focus future expansions on adding fermentation tanks without having to buy another brewhouse. Running things will be Henryk Orlik, a Doemens-trained German brewmaster who most recently worked at Big Bend Brewing in Alpine, Texas. Orlik has been brewing in the U.S. for 30 years, and is open to creating all styles of beer, not just those of his home country. The current thinking is he'll develop an opening lineup of five beers (a blonde lager, an amber lager, an IPA, a hefeweizen and a stout), then move on to other things. McCarthy says that Orlik is keen on on many of craft beer's currently popular trends, so eventually consumers could see Legal Draft branch out into sour beers or the occasional barrel-aged brew. The legal theme, which stems from McCarthy's background as an attorney, will extend down to beer names as well, with Legal Blonde Lager and Accused Amber Lager expected to be among the first products out the door. 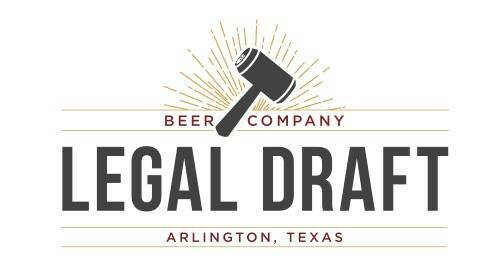 In addition to rolling out beer in kegs, Legal Draft will can its beers from the get-go, though seasonals and limited releases may find their way into 22-ounce bombers in the future. As far as when it will happen, McCarthy hopes to be shipping beer by April, with a taproom grand opening to occur around the same time. Like with all new breweries, though, the actual date will depend on TABC approvals.